Folk music doesn’t get a lot of attention this day and age, mostly due to the overshadowing nature of other genres. But is it deserved though? Diving into Into The Blue by BR Lively, not knowing what to expect is certainly a fun experience, and it did prove itself worthy to be noticed, and then some. Firstly, the instrumentation in these songs are soft, but really nice. Nothing too out there, but nothing too safe either. This gives the album a nice calm feeling to it, especially in songs like “The Blue,” “Oh These Eyes,” “Fighters”, and “Gratitude”, just to name a few. Adding instruments like an electric guitar on “Oh These Eyes”, violins in “Fighters”, and a banjo in “Gratitude”, it adds a unique twist to this album that is a nice touch, and helps it stand out from the rest. Secondly, the vocals really know how to give the mood and feeling needed for each song. Lively’s voice has a nice Bob Dylan-esque style that adds an extra layer of the calm atmosphere, like in the tracks “Oh These Eyes,” “Lonesome,” “Minute By Minute”, and “Gratitude!”, but it can also change with some of the different styles explored within the album, for example, with “Summertime Sky” and its more jazzy style, and “The Day That I Die” with its more country feel. It also mixes well with other elements, like the female harmonies in “Oh These Eyes”, and the guitars in “Coyote”. Finally, the lyrics have this poetic element that really works in folk music, and especially in this album. Ethereal, but poignant as well, like in songs “The Day That I Die,” and “Gratitude”. They’re the main focus when it comes to the track “Minute By Minute”, and it really shows Lively’s talent for storytelling through music. Only criticisms are firstly, in the songs “Are We In It For The Gold?,” and “Free Of,” whilst the production on the rest of the songs is really good, there’s slightly too much reverb on the vocals; it becomes jarring and noticeable that it’s all you can hear in the tracks. The other problem is in “Free Of” again, with the percussion instrument used as the back-beat – it’s an interesting choice for sure, but it really doesn’t fit in with the rest of what the song is trying to convey, and it’s one of those instruments that takes the listener out of the moment, which is sad as the other elements of that track. Aside from those critiques, this is a standout album among the other folk albums, and one that should be listened to by everyone, no matter what genre they’re used to. It’s relaxing, poetic, and simply put, beautiful. It’ll be interesting to see where Lively goes from here, but he’s definitely delivered this one with a bang! B.R. Lively is a musical magician. The Texas-born singer-songwriter has perfected the recipe for stunningly soul-stomping folk gems, a feat that, as far as we're concerned, can only be accomplished by sheer magic. Taking to the road in a 1991 Winnebago, Lively has been traveling across the country, drumming up enough tunes to release his debut record, Into The Blue, earlier this month. The album opens with "The Blue," a gorgeous folk ballad led by acoustic guitar and wailing strings. Lively's voice is lovely but resigned, confessing his own shortcomings amid growing instrumentation and breathy harmony. The song is breathtaking; it slams down on your chest for five minutes, but once it lifts upon its end and you can breathe again, you'll be grateful for its weight. Next comes "Summertime Sky," an uptempo jazzy ode to sunshine and nature. Deep horns and steady percussion merge for a sunny jam session beneath Lively's light vocals. "Oh These Eyes" is a lingering, heavy track with a minimalist vocal approach and a brooding, thundering arrangement that somehow feels like the prettiest heartbreak you wouldn't wish on anybody. On "Lonesome," melancholy instrumental vibrato buzzes before a rapid guitar rhythm comes in alongside Lively's impressive performance, singing "lonesome comes and lonesome goes / it takes me down where the cool grass grows." Next is the vibrant "Are We In It For The Gold," erupting immediately with swells of sharp strings, insistent percussion, and Lively's distant vocals, creating a hazy old-school track for you to shimmy and sway to. Following this is "The Day That I Die," an Americana track led by impassioned vocal versatility and booms of surprising instrumental additions, conjuring similarities to Bob Dylan's raspy storytelling. With "Minute By Minute," Lively takes it back down a notch, offering a tender ballad led by instrumental crescendos that linger then explode. Singing lyrics that reflect on the crippling power of failure, Lively's songwriting is at its most profound here: "No one knows the weight of it all / Sitting here thinking how many times can I kill myself over nothing at all?" "Fighters" begins with a stunning swell of strings that suggests a classical ballad for the ages before groggy vocals come in above them, growing in intensity as a gentle piano rhythm beats underneath. "Coyote" comes next, a personal favorite of Lively's to play live, a howling ode to the night that rings with jangling percussion and wild instrumentation. The second to last song on the record is "Free Of," sparse in its opening guitar arrangement, but featuring Lively's best vocals: his aching, desperate voice delivers a knots-in-the-stomach performance. It's a stand-out track, the weighty instrumentals emitting a bittersweet tone while mimicking the vocal urgency. Into The Blue ends with "Gratitude," stripped of much production, focusing on twangy rhythm lines and a folksy vocal delivery accompanied by higher harmony as the voices collide to sing an important line from the entirety of the record: "I'm thankful for the love I've received." Into The Blue is rich with lush folk gems, each designed as mini stories you can hold in your hand and your heart. B.R. Lively has an unrivaled authenticity that pummels its way to the spotlight of each song. At its most emotional, his voice trembles. At its strongest, it is unwavering. The album is blessed by expert production that accentuates every instrumental intricacy from stunning strings to quivering plucks on a tender guitar. On Into The Blue, B.R. Lively offers songs to swoon over, ones that will break your heart and put it back together again. It is nice, for a change, to encounter music that is truly devoid of electronics. B.R. Lively went back to his Texas roots to record his latest album, and in his latest single "Summertime Sky", incorporates jazzy chords, a dreamy swaying-with-the-trees feel and horns in lieu of the current indie trend of drum pads and atmospheric white noise. "Summertime Sky" will make up for the veritable lack of Jack Johnson-type, feel-good folk on the airwaves at the moment. It’s a celebration of being outside, of enjoying the fullness of nature in a respectful way. It’s easy to get caught up in the busyness of our heads and devices, but there is something about the simplicity of nature that is healing. She can be scary at times, but we’ve got each other and the storms will pass. As with everything in life, there is a natural balance and a lot we can learn if we are open. University of Georgia graduate B.R. Lively has been involved in music since he first picked up an electric guitar at age 13 and started learning AC/DC songs while simultaneously writing his own lyrics. The following year he started learning the acoustic guitar and began playing around town. It wasn’t until Lively reached Athens that he started playing in bands. Lively, originally from Texas, was drawn to UGA because of its music scene and a good academic program relating to the music industry. During his undergrad, Lively majored in marketing and earned a certificate in music business – directed by David Barbe, a leading figure in the Athens music scene. While in Athens, Lively played in several bands. His cover band Bleakers evolved into a funk blues jam band that wrote its own music and was rechristened to New Sneakers. From New Sneakers, Lively moved to a band with his friend Thomas Avery, and they made a record with David Barbe as an acoustic folk group called Night and Day. After graduating from UGA in 2012, Lively stayed in Athens for a year playing with Night and Day. In 2013 Lively relocated back to Texas, this transition from Athens to Austin led to an Americana, roots band Northern Quarters. Of his winding musical journey, Lively expressed. “[It is] very long and very eclectic, but I finally feel like I found a place where it feels more like home,” Lively said. Once back in Texas, a combination of circumstance and personal willpower led Lively to set up a tour for himself from Texas to California. Planning a road trip to visit his sisters in Denver and San Francisco during the summer of 2015, Lively decided to add in some tour dates along his route. Receiving a positive response at these shows, he began to add more and the tour built from there. This tour was set up under the name B.R. Lively – Bryan is his first name, Lively is his grandmother’s maiden name and his grandfather’s name being R.P. Lively, B.R. has kept a familial name connection while making his own easier to pronounce. Significantly, it is also evocative of a particular spirit. “I love the name Lively, just cause the word, the name it invokes such . . . purity with me,” said Lively. Later in 2015, Lively toured again, but this time going east to New York again receiving a positive response to his music. “There was something about being on the road by myself that really triggered something within me that I fell in love with, and the road turned into something that became very meditative for me,” said Lively. Still, Lively views his touring as an experiment. When he was in Austin, Lively decided to let go of his possessions, move into a Winnebago and without any commitments tying him down– decided to go on tour just him and his dog. On tour, Lively is trying to make music life work, and see if it can be his full-time job. He is balancing multiple roles at once such as booking performances and planning a tour through trial and error, being his own support team and handling the technical business side of his profession. All the while gaining experience as a performer. 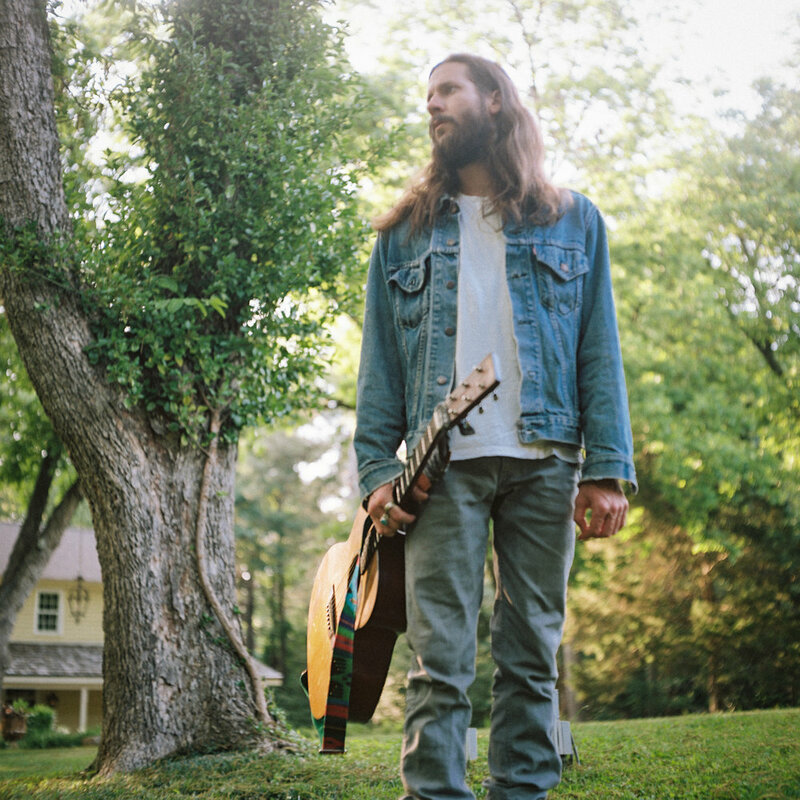 On tour, Lively has been playing songs off his forthcoming album “Into the Blue” which was recorded at Treefort Studios in Austin, Texas with producer Gordy Quist of Band of Heathens. Lively and Quist met at one of Quist’s acoustic shows and during a coffee meeting found that they have a similar approach to writing and perspective of music. Quist expressed an interest in producing and Lively had songs ready to record, so their work together fell into place. Quist chose to record at Treefort Studios, and this location ended up being full of character that could diffuse into the music. “That’s what I wanted to bring to this record, just raw character because they songs come from such a raw and emotional place,” said Lively. The studio space mirrored the rawness Lively wanted in his album which he feared a sparkly studio would diminish. Going into recording without expectations, the process unfolded organically and Lively’s focus was on being present in the moment. “I’m trying to learn to let it be, and let it be as organic as possible,” said Lively of his creative process. Throughout his musical career, Lively has experimented with sound going from funk to folk to jazz. Always exploring and learning, Lively has a diverse background. However, an acoustic sound is what first opened a new world to him. “The acoustic sound to me I feel like is where it really took hold of my writing and really my creativity really came out, at first,” said Lively. With these origins, it is fitting that Lively’s first solo album is rooted in an acoustic sound. “[Throughout my career] I kept coming back in touch with the acoustic guitar and writing, that um it was natural for me to, you know, my first solo record to come out in a more of a songwriter-centered record. That’s where I’m feeling an emotional and soul connection,” said Lively. The name of Lively’s album “Into the Blue” derives from multiple sources – his personal experiences, its connection to nature, and musical influences. The title is directly drawn from the chorus of "The Blue," the first track on the album. Being the first track then, as the listener enters the album, so they go "into the blue." Beyond the album’s contents, Lively said it was fitting that the album title should have the color blue in it as that color bears particular significance for him. “’Into the Blue’ is, to me, walking into this unknown, getting rid of all my stuff, getting into a camper, going out there and just trying to just do something,” said Lively. It represents stripping away all that is unnecessary, and keeping only what was most important which to Lively is his relationships and music. It’s about being fluid and flexible and letting go. “Strip everything away, and go out there and do something new and something that will be unfamiliar, be insecure, and see what happens. And trust that,” said Lively. Beyond this personal meaning and motivation, the title “Into the Blue” also reflects the importance of the color blue to Lively. Blue represents the sky and water, and its connection to nature. Even some of Lively’s favorite records incorporate the word blue like “Kind of Blue” by Miles Davis and “Way to Blue” by Nick Drake. At the moment, Lively's favorite track off his upcoming album is “Oh These Eyes.” Written the day after his girlfriend broke up with him for someone else, it is full of emotion. Yet, in this situation he still saw a hopeful side, and this song encompasses that. Lively describes the song as having a somber beginning that progresses to a releasing outro – a moment of liberation. Lively has grown significantly as an artist since his AC/DC cover days and recording his songs on cassette tapes. However, every part of his journey has shaped his current sound. “[Athens] will forever be a part of my growth as a musician and a person, and I’m thankful for that,” said Lively. Lively plans to go on tour this fall off the release of his album's on Oct. 6. He was in Athens this past May and hopes to visit again on tour this November. Now, Lively is looking to the future, excited to put this record out and take the next step. Throw Ryan Adams and Gregory Alan Isakov’s vocals with Sufjan Stevens’ instrumentation in a mixing bowl, whisk it together, and out would come indie folk artist, B.R. Lively. A self-taught singer and multi-instrumentalist, Lively has always longed for a simplified and quiet lifestyle, and last summer, he finally took the leap. Escaping the noise that surrounded him, Lively sold the majority of his belongings, purchased a 1991 Winnebago by the name of Joanie, and made his way across the country. The new environment and unplugged life led to a journey of self discovery and allowed Lively to create music that was extremely personal. While on the road, Lively hit the studio to record his first solo album titled Into The Blue, which will be released on October 6. An 11-track album inspired by human connection and the therapeutic rush of the open road, Into The Blue was recorded at Treefort Studios with producer Gordy Quist (Band of Heathens frontman) and chronicles a journey of growth, acting as an awakening and an invitation. Today, we are happy to bring you the premiere of the music video for the album’s title track. In this stunning, stripped down performance of “Into The Blue,” Lively hypnotizes listeners with a sound that is effortless while bringing fans in the studio for a glimpse of how the album came to be.